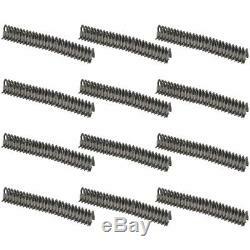 One New Aftermarket Replacement Set of (12) 7 Mato Heavy Plate 14 Segment Lacings that fit Several John Deere Baler Models. Replaces Part Number: BHL20-0008 (x 12), 1701432, AE53298. We carry parts for Engines, Transmissions, Front & Rear Axles, Hitch & Drawbars, Undercarriages, Final Drives, Seats, Bearings, Cups, Cones, Seals, Discs, Couplers, Gears, Brakes, Pressure Plates, Pilot & Throw Out Bearings, Ring & Pinions, Gaskets, Decals and MORE for most high wear items. We also carry replacement parts for the Boom Cylinder (Seal Kits, Tubes, Glands, Pistons, Rods). The item "LACING MATO John Deere 430 466 467 530 535 456 457 556 557 566 567 435 Baler" is in sale since Tuesday, June 16, 2015. This item is in the category "Business & Industrial\Heavy Equipment, Parts & Attachments\Heavy Equipment Parts & Accessories\Antique & Vintage Equipment Parts". The seller is "reliableaftermarketpartsinc" and is located in Williamston, Michigan. This item can be shipped worldwide.